It's all for charidee folks! Hello, hello and a happy hello! I hope I find you well and that you have two minutes to read this important blog post. 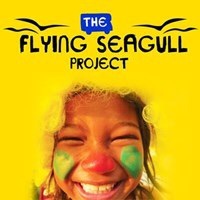 Next month on 25 July I will begin riding my bike from Land's End in Cornwall to John O'Groats in Scotland to try and raise money for a wonderful charity called The Flying Seagull Project. This is a charity that goes to impoverished parts of the world and works with kids whose lives have not been everything a child's should be. They provide entertainment, shows, workshops, therapy and play equipment for communities to continue with the work that they do. They have been working in communities in Romania, Ghana, India, the UK, Cambodia and most recently travelling around the refugee camps in Europe trying to bring a smile to the faces of children and families who are going through untold suffering. They are a small charity and the work that they do makes a direct and lasting impact. I have seen this first hand and it is incredible. So, here is my call to action. For nine days I will cycle more than 100 miles a day along the full length of our country, solo. All I ask of you is that you might have a little time and generosity to donate some money to this cause. Please be assured this is not a sponsored holiday! It is 968 miles and I will be in the saddle for 10 to 12 hours a day. I will do little more than cycle, eat, sleep and repeat. A charity as good and pure as this one requires a grand gesture and I will try to make one. The laughter, smiles and happiness that I see every week at parties deserves to be felt by every child. So please, dig deep and let's see how far we can get. If you are interested in following my progress then this is the place for you. I hope you all have a good laugh at how sore my bottom gets! So Christmas is upon us once again and I for one am flabbergasted as to where another year has gone! It’s been a super hectic few weeks at Jangles HQ, as along with a very full birthday party schedule, I’ve also been taking a little Christmas show around schools. It’s a mix of the party shows and some of the storytelling theatre shows that i do and seems to have gone really well. I’ll definitely be doing more next year. I’ve loved seeing the joy and wonder that Christmas can bring to children and hopefully I’ve added to that a bit in my own anarchic style! Now then, a few corporate shows to go next week and the big day will arrive. Have you written your letters to Santa yet? If not, why don’t you give this a go. Find a magic shop that will sell you some ‘sparkle flash paper’ (this one is particularly good as its thicker so easier to write on). Get your kids to write their letters to Mr Claus on it and then pop it up the chimney with a fire on and watch as all their Christmas wishes sparkle! The effect is fantastic and you definitely won’t risk the letter coming back down. I’ve made a little film of me doing it here, why not have a look! I hope you all have a wonderful festive holiday and look forward to seeing you next year. Well, after lots of procrastination and a very steep learning curve, my new website is finally here! For any of you who know me well, you'll be fully aware that my key skills do not lie in being technically adept on a computer. I spend my life talking and being funny (hopefully) for a living, purposefully spending as little time looking at screens as possible. However, if I'm going to turn the old Joe Jangles business into a multi million pound, stock market floatable venture, there is only one thing for it, a complete, brand-new, rebranding. And this means a new website. So here it is! There are definitely things I'm not completely happy with yet and I will continue to edit and change it as I go along. But, I feel as though it's already so much better than my old website, it would be silly not to have it up for your perusal. There is no way I would've been able to get this done without the fantastic software that Squarespace have. It only took me about a day of playing around to start to get the hang of how it functions, and I really feel now as I could go on to build another website if needed. If there is something you feel needs changing or even something that works particularly well and you'd like to tell me about it, then please don't hesitate to get in touch, I'd love to hear from you and I think you can comment below. So there we go. A new website, my first effort at a blog and a whole new Joe Jangles world.